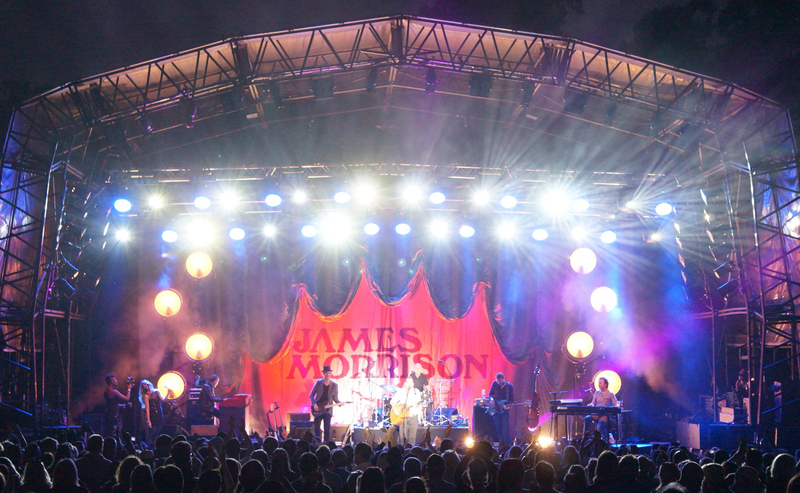 In 2012, Martin’s Lights lit several of James Morrison’s shows on his summer festival season for James’ lighting designer Cate Carter. She asked us to do the same this year, and we looked after seven shows in Austria, Germany, the Netherlands, Portugal, Switzerland, Belgium and the UK. 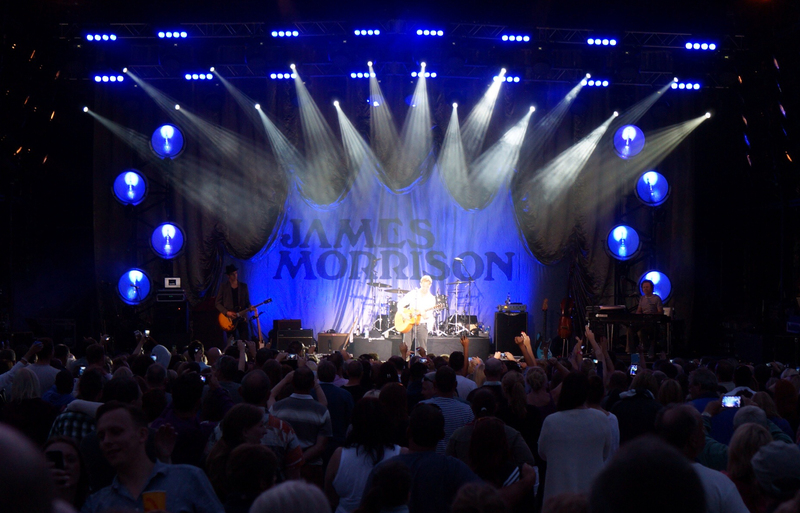 The shows were a mixture of trucking dates, where Neg Earth supplied a lighting extras package, and fly dates where the only equipment taken to the shows was a silver backdrop featuring James’ logo, and a ChamSys Magic Q PC system consisting of a touchscreen laptop and Maxi Wing control surface, supplied by Martin’s Lights. 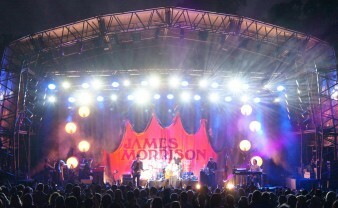 On the truck dates, the extras package featured a second gold gathered backdrop, two 4m lighting towers each supporting four 5kW Skypan fixtures and four Martin MAC101 moving lights, with seven Clay Paky Alpha Beam 300 moving lights and five two-cell blinders on the floor, and nine BB4 units to light the backdrops. The control on these shows was a full ChamSys MQ100 desk with Playback Wing. 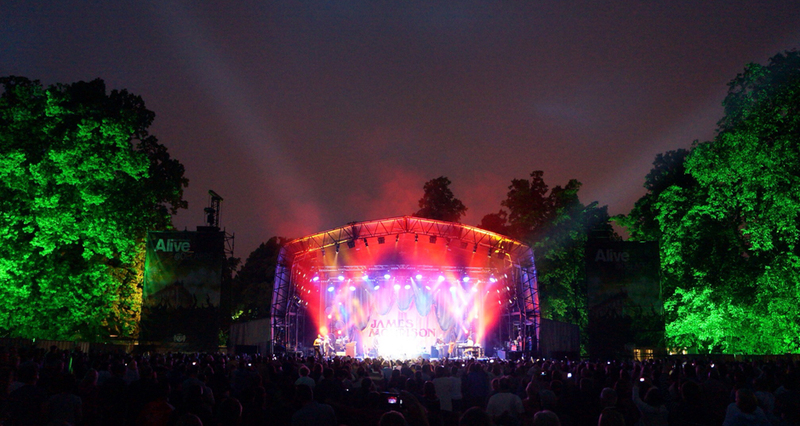 Both versions of the ChamSys desk were used to control the festival lighting systems and the extras package, and extensive use of the fixture cloning and morphing facilities was made to enable the show to work with the wide variety of rigs encountered. The photos on this page are by Becky Nallon. Copyright Becky Nallon (2013), all rights reserved.